Dr. Keith Stantz is a Professor of Imaging Sciences and Medical Physics within the School of Health Sciences at Purdue University. Dr. Stantz obtained a B.S. degree from Valparaiso University in ECE and Physics (1988); an M.S. degree in Physics from Michigan State University (East Lansing, MI); and a PhD from Indiana University (Bloomington, IN) in particle physics, where he was part of the MEGA research team investigating rare muon decay at Los Alamos National Laboratory. As a Project and Research Scientist at two small companies and IUSM, he developed CT, optical and thermoacoustic imaging instrumentation and methods. 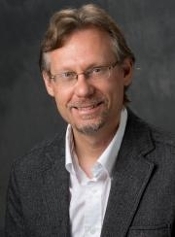 As a faculty at Purdue, his research continues to focus on developing diagnostic imaging in the treatment of cancer, and the training of students in the Medical Physics and the field of Imaging Sciences.